India is a democratic country with 125 crore people. Our constitution defines equal rights to every individual irrespective of their caste, creed, and religion. But, our politicians divide us on the basis of these factors. We have seen various incidents where political parties have given reservation to a particular caste or religion in our country for their political gains. They had given reservation to selected communities and groups in higher studies and government sectors. Political parties shout that they had given reservation to uplift that group in our society. But, we all know that it’s a political step to strengthen vote bank. You have given reservation in higher education but have you did anything for their basic education. Have you organized a campaign to provide necessary help for competitive exams? We are very much aware of the Indian government school and its educational level. It’s that phase when private school students go ahead of government school students. Then, reservation plays a fantastic game and those who work hard lose their seats. This is not because of lower class people, politicians are responsible for it. 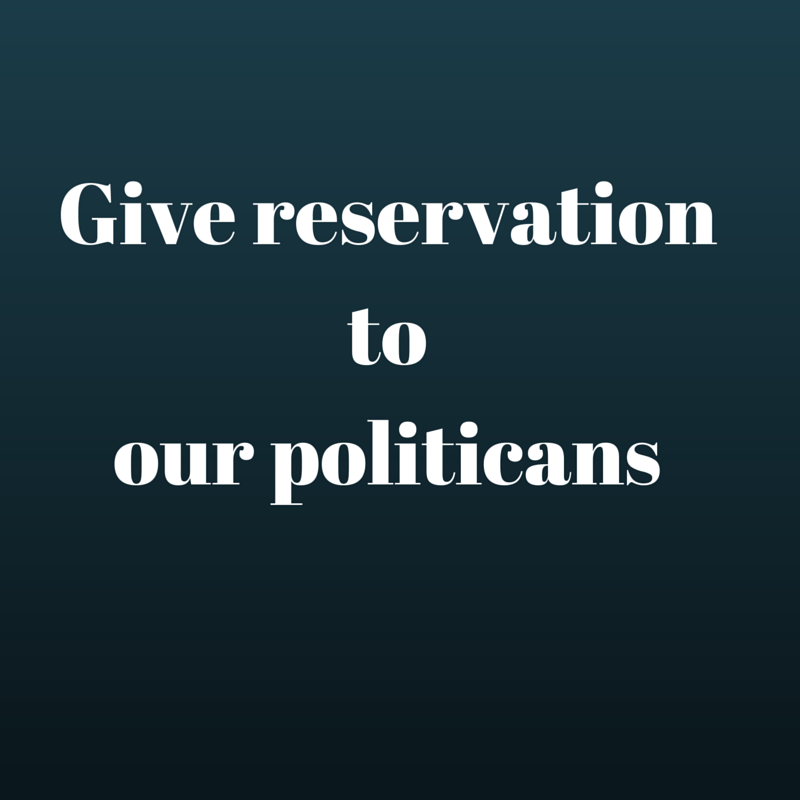 Our various communities and groups need a reservation but it should be different and effective. Indian government should focus to distribute competitive books and materials among students who are preparing for civil services and other competitive exams. Once they will achieve excellent scores with their hard work, no one will get a chance to criticize them that they got the seat because of bloody reservation. Education is everyone’s right and one should get it. Our government and their policies should keep a minute watch on our education system. Many innocent mothers, fathers, sisters, brothers have lost their closed ones because of reservation. Some fired them in rallies and some commit suicide because they fail to get admission in a selected college or university. But, no one will take strict action on it. So, Indian law must take some strong decisions regarding reservation. If politicians are doing it for the welfare of community then they should access the services of reserved people in their personal life. Many Indian politicians go to foreign land for treatment or appoint the best Indian doctors. But, they should access the services from a Doctor who belongs to a minor community or caste. You have taken the initiative by offering them a medical seat and helped them to become a doctor. Now, please make their career successful by taking medical services. Are you worried about their talent? Many political parties and leaders hire Multinational IT companies for their online publicity and PR marketing. Why not you access the services of a marketer or IT person belongs to a minor category. Do you have a doubt on their potential? We have seen many cases where big political leaders who had launched campaigns for reservation but appointed big lawyers to fight their cases. We Indians are urging you to take services of minor people and uplift their image in the society. Give them a chance to defend you, it will help them to show their potential to the public. We are not against reservation. But, we are against the cheap politics played by the politicians in the name of reservation. You are giving seats to them in colleges and universities, it’s good. But, please take care of them from the initial stage that helps them to sharpen their skills and to give a strong fightback to their competitors.